Let's continue with No. 10, A-Rod's game-tying homer in 2009 ALDS Game 2. 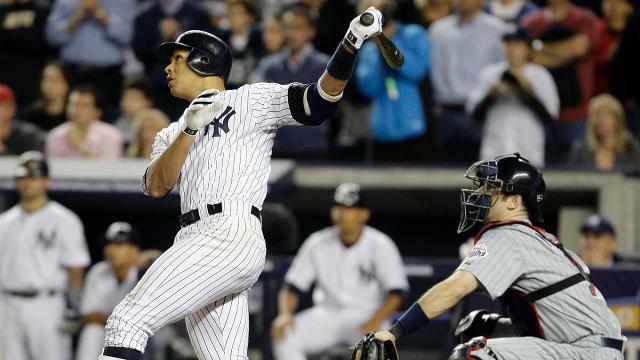 Although he finished his career with three MVP awards, 696 home runs and 3,115 hits, Alex Rodriguez's crowning achievement came in the 2009 postseason. That all began with ALDS Game 2. With the Yankees trailing by two runs in the ninth inning, A-Rod blasted a Joe Nathan offering into the Yankees' bullpen to tie the game before Mark Teixeira hit a walk-off home run two innings later. The Yankees won Game 1 of the 2009 ALDS handily enough behind CC Sabathia. Installed as favorites for the '09 postseason, the Yankees knew it was imperative to brush aside the Twins quickly. Going even four games would have meant starting Sabathia on short rest and changing their rotation for the worse in subsequent series. Like so many classic games, this one started as a pitchers' duel. A.J. Burnett and Nick Blackburn were at their best into the sixth inning with zeroes overwhelming the auxiliary scoreboard. Burnett finally cracked, in the sixth, giving up an RBI triple, but A-Rod tied it up with a two-out, RBI single in the bottom half of the inning. With the score knotted at one, Phil Hughes got two quick outs in the eighth but ran into trouble soon after. He gave up the go-ahead single, and Mariano Rivera couldn't stop the bleeding with the Twins knocking another RBI hit off the vaunted closer. The Bombers would go 1-2-3 in the eighth, while Rivera worked around a two-out single in ninth. So the Twins went into the ninth with their closer, Nathan, on the hill and a 3-1 lead. Teixeira led off with a single off the right field wall, bringing up A-Rod. Rodriguez already had three RBI singles in that ALDS and had looked comfortable in high-pressure spots. His walk-off against the Red Sox in August and the Twins in May only increased his confidence. So when he was given a 3-1 fastball to drive, he took advantage. After A-Rod's tying blast, Alfredo Aceves got through a shaky 10th. The Yanks loaded the bases off Nathan in the bottom half and seemed poised to walk off, just for Johnny Damon to line into a double play against Jose Mijares. Damaso Marte and David Robertson loaded the bases in the 11th, but Robertson would not wilt. He pulled off his signature Houdini act and wiggled out of trouble. Just like in the ninth, Teixeira led off the 11th with a line drive. This time, A-Rod wouldn't get a chance for heroics as Teixeira sent his liner off the top of the left field wall and into the seats, ending the game and sending the 50,000+ fans in attendance into pandemonium. The 2009 postseason would bear further fruit for Rodriguez, who had tying homers in ALDS Game 3 and ALCS Game 2. In the World Series, he'd hit the first replay-reviewed homer in World Series history and smack the go-ahead double in Game 4 as the Yankees won their 27th championship.